Pixar is the best of the best when it comes not just to animated films, but to movies in general. Its creations are true works of art: They’re gorgeously animated, innovatively designed, rich with humor and emotion, and full of characters you actually like. The movies tell wonderful stories and make impressive, subtle use of 3D. They’re as rewarding for adults as they are for kids — sometimes even more enjoyable for adults than for kids. No wonder the company’s had an unparalleled streak of winners, going back as far as the original Toy Story film in 1995. With the exception of Cars and its sequel (which I didn’t see), nearly every other film they’ve made has been a winner: Up, Rataouille, The Incredibles, Toy Story 3, Finding Nemo, etc. … No other film studio can touch that resume. 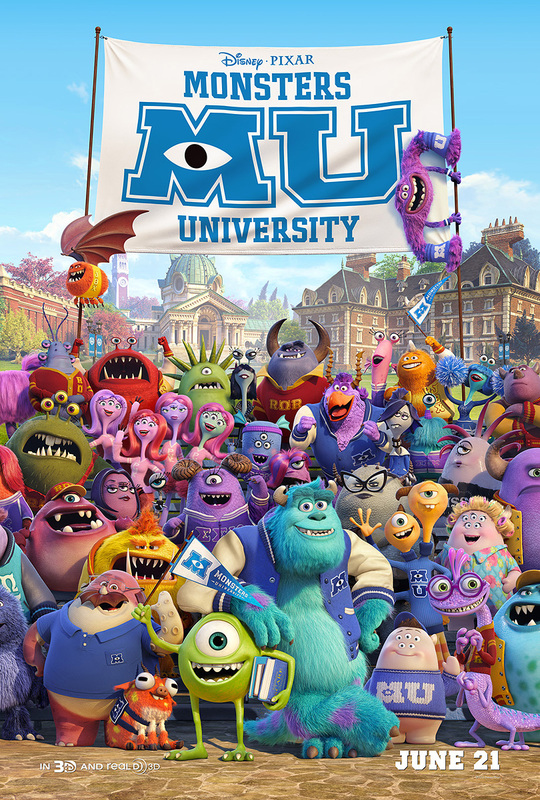 A prequel to 2001’s Monsters, Inc., this latest adventure takes us back to college, where Mike Wazowski (voiced again by Billy Crystal) meets James “Sulley” Sullivan (John Goodman, now in his seventh film in the last 12 months). Mike is the book-smart know-it-all who works hard to fit in and stay in school, while Sulley is the slacker frat monster who thinks he can coast on his charm and the fact that he’s the son of a legendary alumnus. It was an odd bromance right from the start. 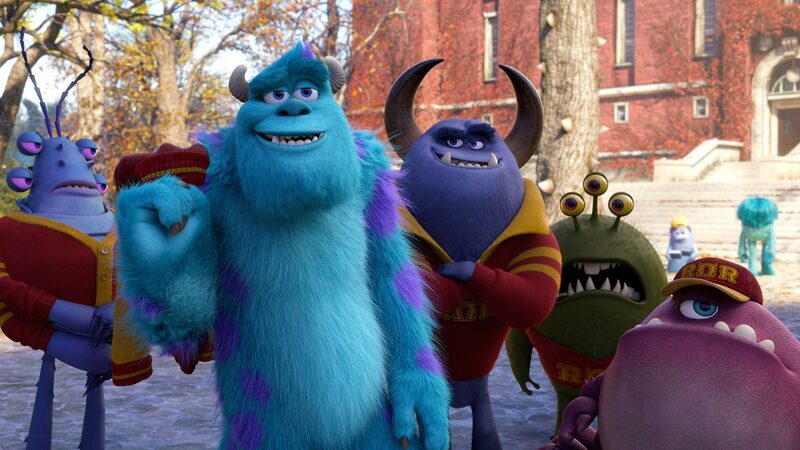 Most of the film is about how Mike and Sulley begrudgingly get stuck in a frat full of losers, and how they rally together to compete against the other fraternities and sororities in the Scare Games to find out who the best scarer on campus is. Also on the line: Guaranteed placement in the school’s Scare program (a precursor to a job harvesting screams at Monsters, Inc.) and a giant “I told ya so” to the dean, voiced by Helen Mirren. The film’s a colorful, family-friendly mashup of Animal House, Revenge of the Nerds, and nearly every other college movie ever made, and it’s pleasant enough. The problem is it just doesn’t have the same spark of inventiveness that the original had. Not that Monsters, Inc. is one of my favorite Pixar movies, but the climactic sequence where Sulley, Mike, and Boo ride the doors as they head into storage is one of the best things Pixar has ever done. There’s nothing even close to that in this film. Worse, I can’t think of a Pixar movie where I’ve laughed less. Many of the jokes are too easy and obvious. And Crystal and Goodman don’t even sound like they’re trying to be funny. So I’m not going to linger on this one. I’ll just say Monsters University is a bit of a disappointment — an unnecessary prequel that adds nothing to the story and could just as easily have gone direct to DVD. Of course, it’s a bad movie for Pixar, which means it’s not entirely awful. But when you’ve set the bar as high as they have, your fans have some great expectations. Call it a consequence of prior success. I’m giving Monsters University a C+. What’s your favorite Pixar movie? Share your thoughts in the comments section below.